Oooh! DAM Stuff...I've had to order the KSP42's from China so they'll be awhile. And the others from the UK. Do recommend any other transistors in both positions for the meantime? Looking at the gain, the KSP42's look like they may be other brand MPSA42's, and the 2N4401 has the same gain range listed as the 2N3904. So there should be plenty you can experiment with there. Settled on MPSa18 and 2N3903. That should of read '2N3904'. DAM designs never fail! Tag it. That was quick! Nice one Miro, and good idea about the LED resistor, I don't know why I forget them sometimes when there's plenty of space! No problem. I've come a custom to adding led wiring to the dc jack, but sometimes it's good to wire it to the board if there is room to do that easily. 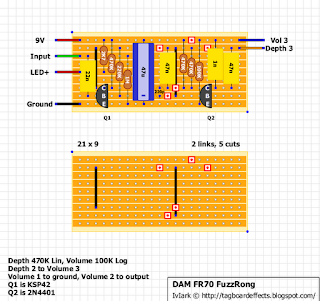 Sometimes i take two wires to 9V strip - one to power source and other to the LED resistor..
About the transistors. I'm not sure why Q1 is a high voltage device. Maybe that's supposed to sound "bigger" with small voltages. What i learned from my circuit is that for Q1, anything BJT silicon at 75-150 hFE works perfectly, and for Q2, anything BJT silicon at 300-400 hFE is good. I tried a few different sets, but those gave me the results i liked. My 2N2222 TO-18 measured ~120 and BC338 TO-92 measured ~360. By the way :) The unverified tagboards may get verified faster, if you add vero to them as a option :) There are a few interesting layouts there, but i find tagboard clumsy to build. If i recall correctly, there's something like 5 unverified left. 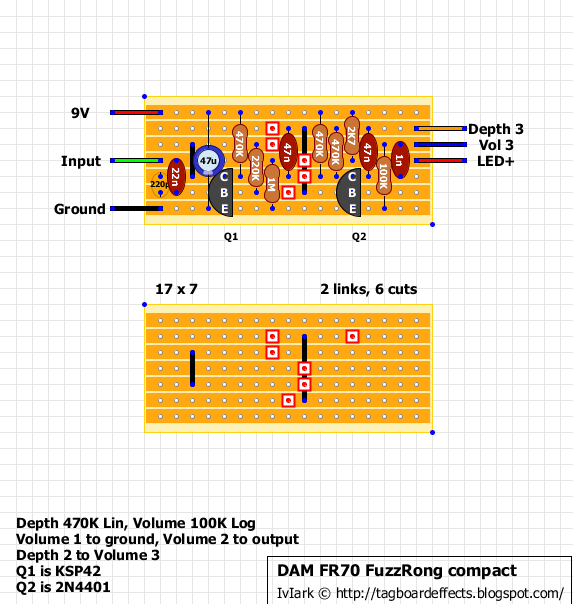 I started building 'cause of the Fuzzrite family. If this sounds as good as the clips, it's going to kick my Fy-2 off the board. The only other sub was a 500kC for the Depth. I don't have a 470k handy and I seem to have accumulated a number of reverse log pots from various failed or disappointing projects. mirosol is correct that the 0 setting is useless, but the reverse makes for a pretty smooth transition. How does that sound, Piltdown? I have a 500C left from a DOD250 project that kinda sucked. Not bad, just not good, that one. It seems to be fine. I think it's a smoother change over the spectrum than the non reverse pot. But I don't know how different it sounds from a 470. I have a number of them so I figured I'd put them to some use. What's the worse that can happen, right? 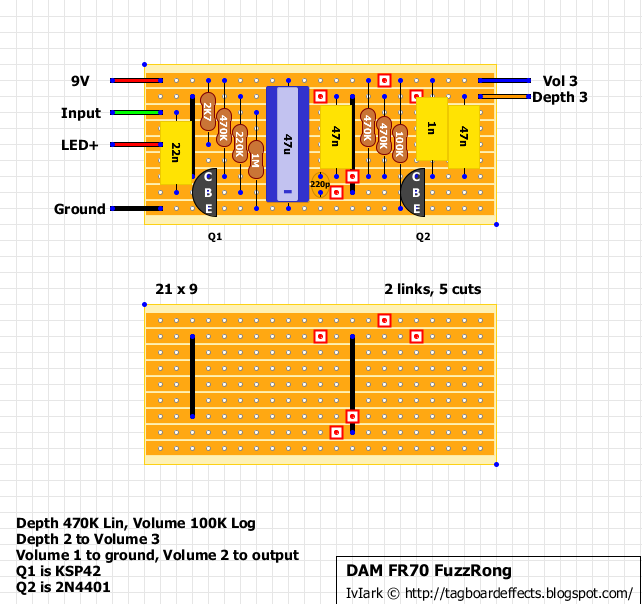 I have a general question: can you use a metal dc jack in a metal enclosure? The box is ground, and the outside of the dc jack is positive (center negative). Is there a trick to do this or can you only use a plastic dc jack in a metal enclosure? Okay, where is depth 1 going to? To ground? It's usually coming from the emitter of Q1 through a cap on these style pedals! i meant the collector (sheesh). Thanks, I guess it is a bit of a redesign after all, not a simple component swap. Great job, D*A*M! Hi Ivlark, brilliant thanks a lot, just across the border in yorkshire near bradford, cheers! Love it. Like all DAM circuits. Just built this guy. Sounds great. I used a 500k pot for Depth. The entire sweep is very usable. Not a bad sound to be found in this box. I do wish it was a little nastier and splattier though. This is definitely more refined than your average 60's fuzz. Just saw this post. I snipped the 220p cap, but I could not hear any difference. Am I deaf? Haha. Anyway, I very much like the sound of this as is. 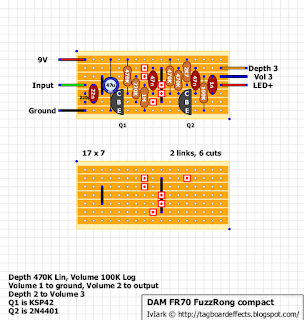 Quite similar to the DAM Drag'N'Fly I built earlier, but with a touch less gain, and a bit more clarity, even though there seems to be a bigger bass presence in some way. Sounds awesome for buzzy single note lines on the D/A/E strings. Alright, so while boxing this thing up, I realized a few mistakes i made. Now the things sounds as it should. Buzzy tone for sure! Just finished, sounds great. With David, my faith in silicon fuzzes is getting bigger. Used a MPSA42 rated 95 hfe for Q1 and a 2N4401 rated 300 hfe for Q2 (stick to specifications, KSP42 and MPSA42 are the same trannie, different manofacturer). Definetely, with D*A*M effects you can't go wrong, anything will sound fantastic. Work perfectly with two MPSA18, gnarly enough, i love it. So i came up a slight mod. The first 40% of the depth was imo unusable, making the circuit sound like stock 66 tonebender - thin and piercing. Which is without a doubt a feature in the original. But i wanted a bit more balls to it. So i ended upping the 1n for 6n8 and lowering the depth pot for 250K. Didn't do anything else, but i think that upping the right hand side 47n for 100n could be worth a try too. Put 2N2369 for Q1 and 2N2222 for Q2. Loving it. I started building this and realized I didn't have any 470k resistors, so I socketed those holes and twisted pairs of 1M in parallel and used those in place of them. It looks ridiculous, but it sounds really awesome! I had some mpsa42's i ordered from tayda... upon closer inspection they are actually labelled ksp42! sounds killer with ksp42 hfe 120 and 2n4401 at hfe 265. Ordered a KSP42 especially for this one and must say i am not disappointed by my decision. The depth pot gives a great blend from a really nice fat fuzz with it fully CW and a real thrashy fuzz fully CCW and all the resst inbetween. Likey Likey!!!!! Built today using BC108-B (T1) and 2N2222 (T2). Sounds fantastic, versatile and useful pedal. Thanks for posting. Just built it last night. Didn't box it before I rocked it, but totally lucked out. It sounds awesome. Gnarly fuzz. This one just might have to find a permanent home on my pedalboard.